Lletya is a village on the east border of the elven land Isafdar and is accessible after starting the Mourning's End Part 1 quest. 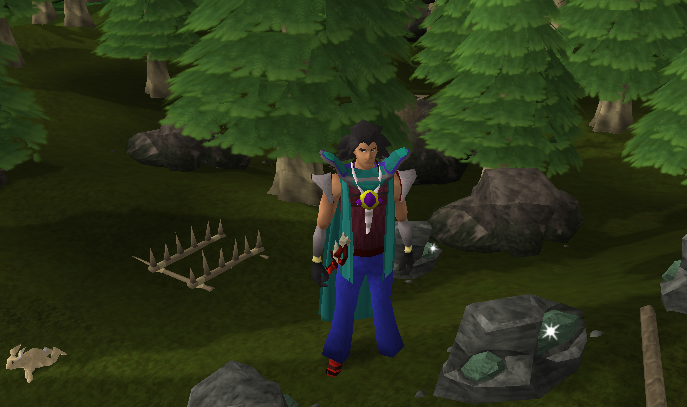 It can be reached by foot or by teleporting there with the crystal you get as reward from the afore-mentioned quest. For information on getting there by foot check out the Map of Isafdar. 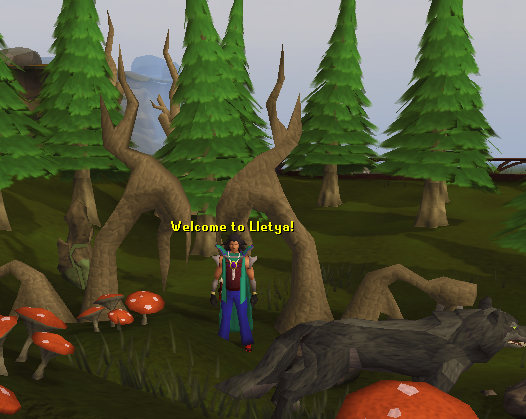 Welcome to Lletya, there are lots of things to see here in Lletya, so be ready for an interesting trip! 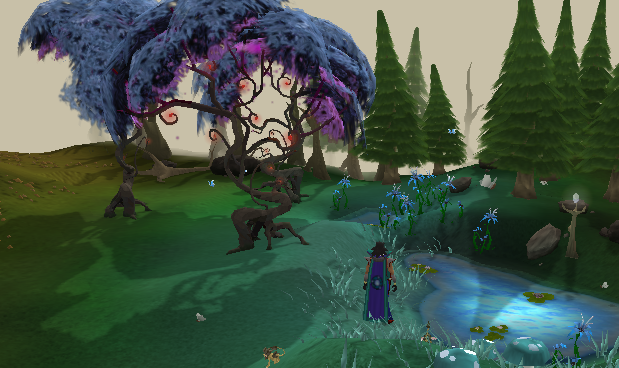 To enter Lletya, pass by the weird-looking tree at the back of the picture. 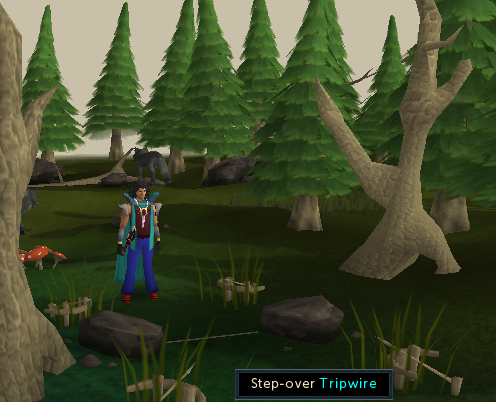 Beware of the level 88 Dire Wolves and the Trip-wire trap nearby. Before going to Lletya itself we'll have a look at this place. 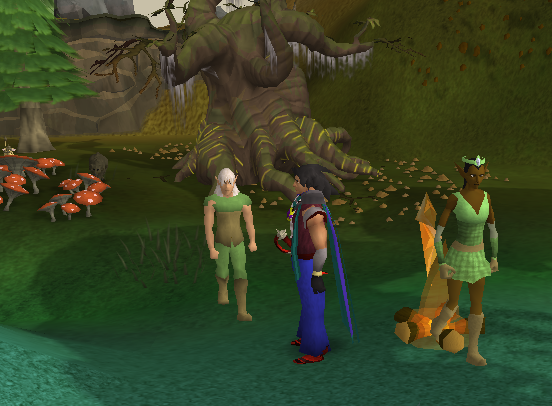 Here you'll find the two roving elves Islwyn and Eluned, besides some Grizzly Bears and three Magic Trees. If the elves don't seem to be there wait a few minutes for them to appear. 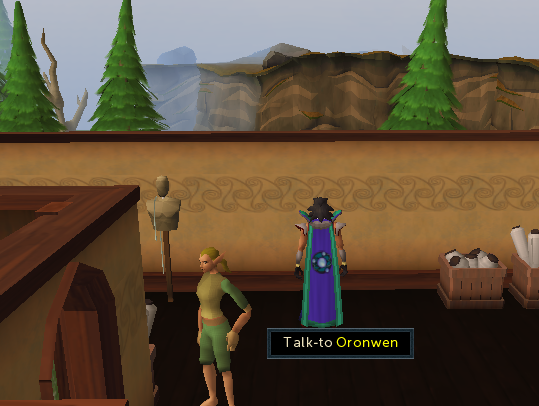 Islwyn is an important person in the Roving Elves Quest and will sell you crystal bows and shields. Eluned is the starting point of the Mourning's End Part 1 quest and will recharge your Lletya tele crystal for a price. Not far off you'll find an adamant mine with four rocks, some rabbits and a stick trap. Let's leave the forest behind and enter the village. 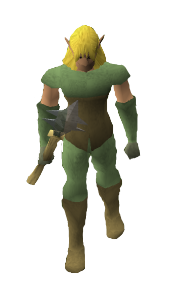 Here you'll find some Elf Warriors to kill for slayer, elves to pickpocket if you have level 85 thieving and some useful shops. 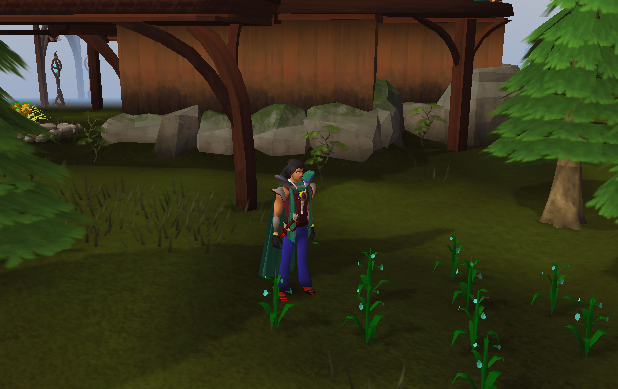 The numerous flax plants near the bank make Lletya a paradise for getting flax. The spinning wheel is also nearby. Here you can buy various types of Arrows and Bows. At the clothes symbol you'll find Oronwen's the Seamstress' shop, besides a spinning wheel. Oronwen also plays a part it the Mourning's End Part 1 Quest. There is also a General Store run by the elf Eudav, which just sells the standard adventurer's items. 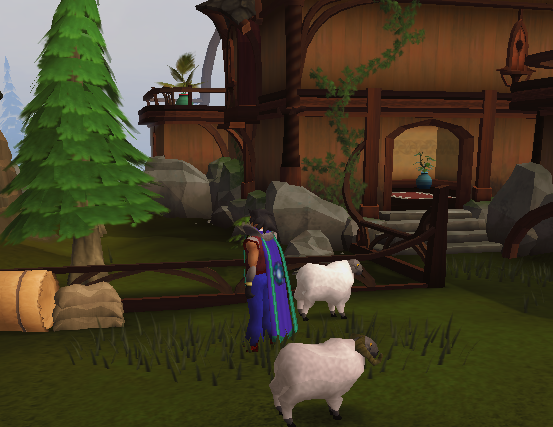 Yes, the Varrock bank can be found everywhere. In the eastern part of Lletya where the quest symbol is you'll find Arainwyn, who's the starting point of theMourning's End Part 2 Quest. There is also a bookcase with some interesting books on elven history. 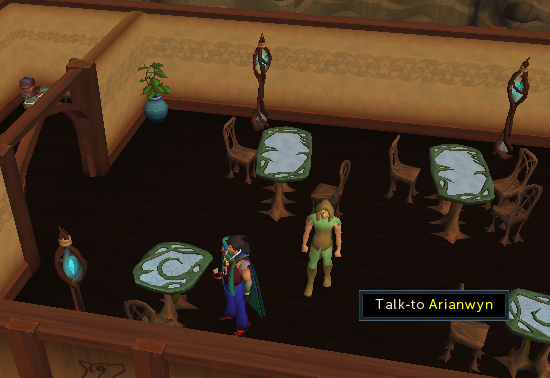 You may have to bring one of them, Prifddinas History, to the dwarf in the Temple of Light during the Mourning's End Part 2 Quest. 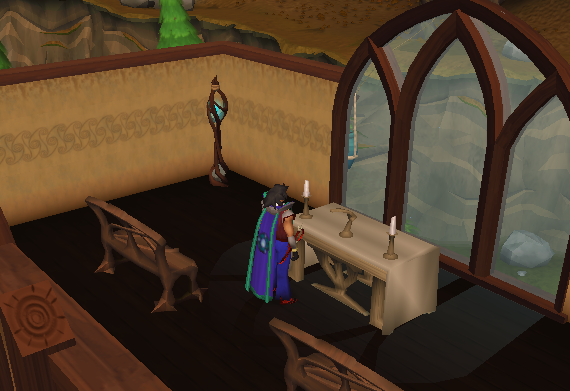 Upstairs you'll find a prayer altar. Upstairs in the southern house with the range symbol you'll find Gethin's food store and two ranges. The wine price is very good for rangers and mages as the side effect will lower melee combat skills and not influence ranged and magic. It also heals a decent number of Life Points and costs nearly nothing. 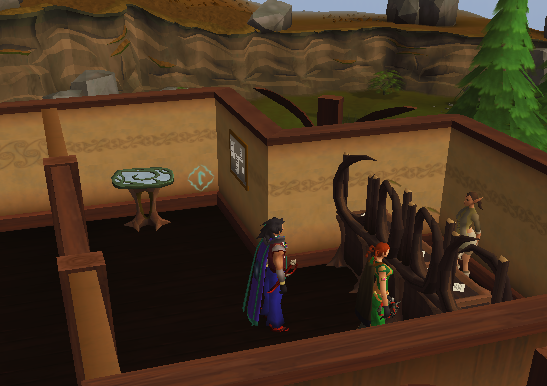 There are quite a few NPCs in Lletya, from shop keepers to other citizens. There are two kinds of Elf Warrior in Lletya, neither of them are aggressive. Note: There are several good spaces for killing the level 108 Elf Warrior one with ranged or magic; for example the benches at the entrance and the fences.